Happy Easter everyone! Here in the St. Louis area spring is popping out all over. My crocus and my daffodils are blooming simultaneously. The violets are about to blossom. It’s hard to stay in and write, but I have a book deadline followed by a book deadline and I have a blog post to write. After all, I promised that we’d discuss brain junk. I’m amazed how many writers hold fast to this particular piece of brain junk – the idea that you have to choose to write or have a life. If you’re a writer, you write. You just aren’t happy if you aren’t putting words to paper. But you have to “have a life” for your writing to be vibrant. Life, after all, provides inspiration. This spring, I challenge you to give up the idea that you have to choose one or the other. Look for ways to have both. Start with the big bad job. When you write, start with what you are most likely to put off. 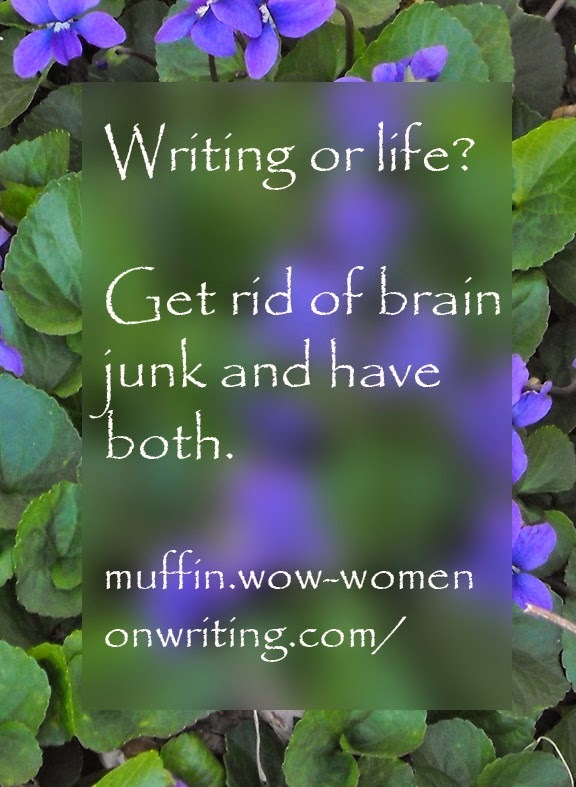 Get that done and you won’t spend the rest of your writing time procrastinating. You’ll dig in and get things done. Take breaks. That’s how I’m meeting my deadlines and enjoying the spring weather and flowers. I write a section, then trim a butterfly bush. Write another section. Pull last year’s mint. Another section. Rake the leaves out from under the sage. Schedule non-writing things daily. Writing may be my focus but I try to do something non-writing each day. This week, I’m volunteering at the high school and having dinner with my family. We’ll also spend time outside as my son gets ready to build a community garden. Fun first. During Spring Break, we went to Dayton. We visited the Air Force Museum and went to dinner. Then I got to write. Make things fit. When I squeeze in writing time, I focus on manageable tasks. Blog posts are good, whole chapters less so. If I only have thirty minutes a day to write, I tailor my task to fit. Praise and praise some more. When I get something done, I thank my family and let them know what I accomplished. Giving me 30 minutes to write means more when I accomplish something. Facebook? Not so worthy. Muffin post? Worthy. Writing and life. As writers we need both. Get rid of the brain junk that makes you believe it is impossible. Now hop on out and enjoy Easter so that you have something to write about. Great advice, Sue! I need to follow it. Happy Easter and Spring to you, Sue. Great post! It's so important to find the right balance of fun/life/writing/business. I find that prioritizing all of my tasks helps when I've got a lot on my plate. And if I'm particularly busy with huge ventures, like I am now, I set up "base camp" goals to achieve while climbing the mountain of work, so I don't overwhelm. I like the idea of clearing out brain junk. I find that tackling the shorter pieces I have due also first helps me stay on track and not get overwhelmed. Angela, "Base camp" goals. I like that idea. Renee, I try to have a few small tasks just so I can cross something off. That way I feel like I'm done with something.